Curtis Valentine, Daniel Kaufman and Beverly Anderson will work alongside nine other elected school board members. WASHINGTON – While kids and teachers take a break for summer vacation, school leaders in Prince George’s County are buckling down to hit the ground running for the next school year. 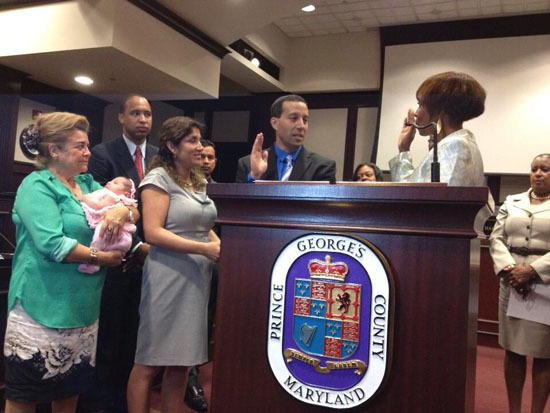 Three newly appointed members of the Prince George’s County Board of Education were sworn in Monday, June 17. Curtis Valentine, Daniel Kaufman and Beverly Anderson will work alongside nine other elected school board members. All will work with Board Chairman Segun Eubanks, who was appointed June 1. New members say they are dedicated to making a hybrid board and a lagging school system work. Kaufman, who’s worked in education and communications, has a daughter who is a second-grader in Prince George’s County. “I want to make sure that all children across the county, whatever the background or wherever they live, have the same opportunities she’s had,” he said. Valentine, a former Oxon Hill middle school teacher, says he’s committed to the newly overhauled school system and optimistic change will bring improvements. Eubanks says there’s still one more step to completing the overhaul of the school system. “The next missing piece is to hire a new CEO who is going to bring the background knowledge and skills that we need. If we get that missing piece, we think we can make it work,” says Eubanks. Under a new reform plan, County Executive Rushern Baker will appoint the new CEO. Eubanks says that person could be in place by the start of the next academic year.